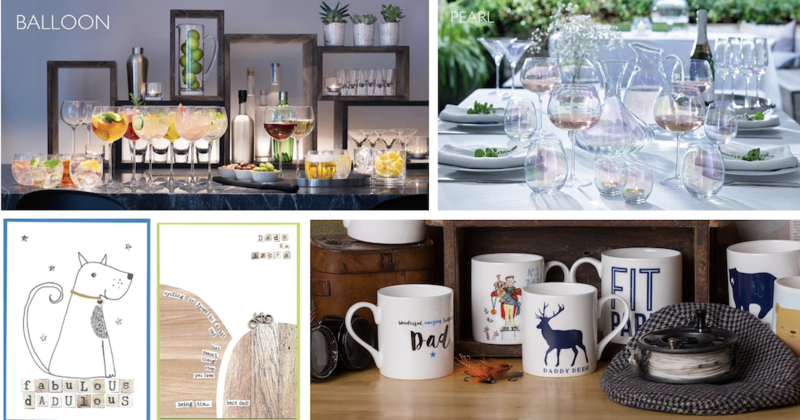 Father’s Day gifts, flowers for your garden and home, outdoor furniture and lanterns, lawn-mowers, and all you need for a game of tennis – these things and more are available in Uckfield area shops during June. Don’t forget Father’s Day is coming up on Sunday, June 17. Carvills has a selection of gifts and cards. New in is contemporary glassware from LSA. The Mixologist collection is modern drinkware with stepped silhouettes and thick stems for an array of cocktails while the Pearl collection is individually hand-painted with a sheer mother of pearl lustre. Contemporary glasses and Father’s Day gifts and cards at Carvills. E Coffee Cups are back in stock with new colours and designs. They are made with natural, sustainable bamboo fibre and light and lovely to drink from with no plastic after-taste. The cups are fully dishwasher safe, including lid and sleeve and their reuse cuts daily consumer waste of single-use cups. A Father’s Day raffle is being run by jewellers W E Clark and Son with all proceeds going to The Children’s Respite Trust. Tickets are available until Friday, June 15, for a donation of £1 each, from the shop at 39 High Street. There are three bundles of prizes for the winners, which include gifts donated by other High Street businesses including Carvills and Josefina. The first prize includes a Bering watch, worth £149, while the second includes a Unique men’s bracelet. Winners will be contacted direct and also announced via the W E Clark and Son Facebook page on Saturday, June 16, just in time for Father’s Day. A Bering watch and Unique men’s bracelet are included in prize packages for a Father’s Day draw being run by W E Clark and Son jewellers. Puzzles, books and smellies are among a selection of gifts for Father’s Day at Chestnut Tree Children’s Hospice charity shop at 23 High Street. Father’s Day gifts at Chestnut Tree Children’s Hospice charity shop. The charity shop has a date for your diary too because on Tuesday, August 28, it will be launching a wedding fair. There will be a preview event from 6-8pm with nibbles and bubbly and the fair will run for three weeks after that. The shop will be dedicated to all things wedding, from dresses to top hats and tails, bridesmaids dresses and outfits for the mother of the bride. There will be accessories too, including hats, cravats, shoes, handbags, gifts and even new underwear. During the launch event people will be available to give advice on hair, make-up and flowers for your big day. Do call in and speak to shop manager Angie if you would like more information about the fair. Glorious hanging baskets, spikey cacti, bedding plants, hydrangea, summer flowering bulb packs (buy one get one free) are among the flowers and plants available at Staverton Nursery at Halland. Deals include orchid pots with a recommended retail price of £7.99 being sold for £2.99 and buy one get one free, 9cm veg plants which were 99p now 50p, Darlac compact plus pruners at £10.99 instead of the recommended £14.99. Jack’s Magic all-purpose compost is back in stock for £6.99 or three for £15, and 2.5 litres of Roundup pump and go is available for £9.99 instead of the recommended £17.99. Spikey cacti between two glorious hanging baskets. All available at Staverton Nursery. 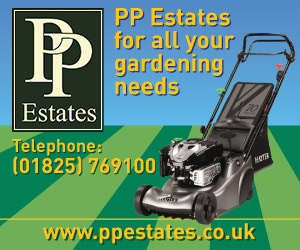 PP Estates is offering a free Mitox strimmer when you buy a garden tractor from them during June. Philip Eves, from PP Estates, with a Mitox strimmer free with every purchase of a garden tractor during June. Green DIY is focussing on the garden now with barbecues, lawn-mowers, solar lighting and composts all displayed prominently in their Bellbrook Estate store. Need something for your summer garden? Green DIY is well stocked for the new season. The company’s brand manager Robin Eden says they have developed a winning mix of quality products and advice for people tackling projects at home and they are now looking to open similar stores in the South East. Read more about their plans here. Don’t forget that as well as having everything you will need for DIY a fishing tackle shop has also opened there. It’s called Hooked on Green and aims to provide the local angler with a wide range of quality fishing equipment and bait. A look inside Hooked on Green where the aim is to suit all budgets and fishing passions. If you call in to have a look around you will be the opportunity to have a chat about fishing too, with Joe who manages the shop or Robin who spends time in there too. Both are keen fishermen themselves. Look out for a woollen Wendy house in the window at Sew n Sew. It is being used to promote the huge range of wool in the shop. A woollen Wendy house in the window at Sew n Sew. Also new is thread by Madera, mini-ribbon bouquets and flowers and bows on clips. See below. Madera threads, mini-bouquets, and bows on clips – new at Sew n Sew. There’s plenty of choice at Josefina when you are looking for Father’s Day gifts. Just a few present ideas are included in our pictures below. Ideas for Father’s Day gifts at Josefina. The Josefina website is currently being updated to show the furniture available which can be hand-painted with colour from the Autentico range and with your choice handles and knobs added. See what is available here. A date for your diary: Josefina is holding a lampshade-making class on Saturday, June 23. A fun and information afternoon is planned and the £35 price includes your kit so you will take home your own lampshade in your own of Josefina material. 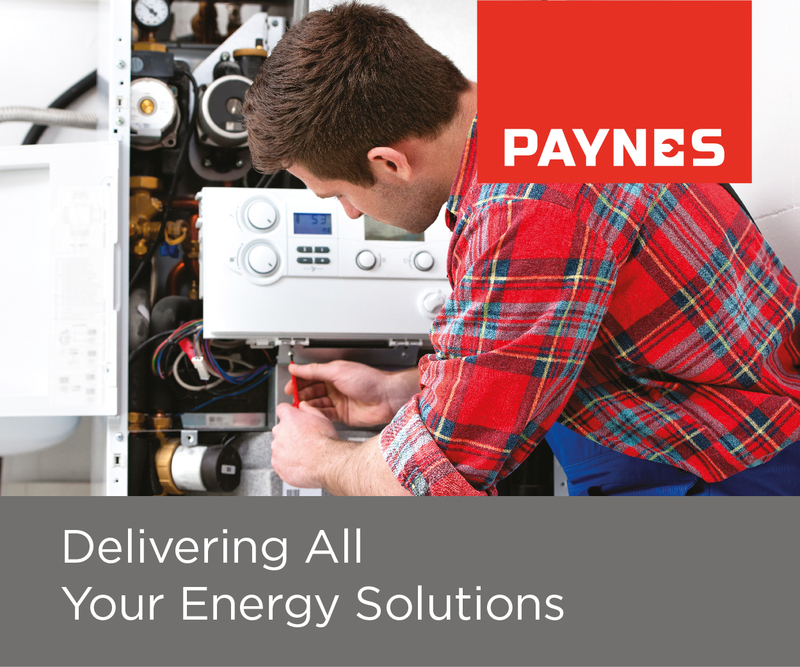 Contact the shop to learn more. Deliveries are arriving weekly, if not daily, now at Chapter Three and natural fabrics are proving popular with customers as hotter weather emerges. Cotton T-shirts are cool and those with stars on are being snapped up so shop owner Kay Bevan is re-stocking. People are starting to think about their holidays and, as well as clothes, you will find beach bags in stock at Chapter Three. Don’t forget they always have new pieces of jewellery and look out for a new candle and home fragrances range starting this week, made by a local company Parkminster. Kay says they are ideal for your own home and also as gifts. Cool cotton T-shirts, like the one on the right, are proving popular at Chapter Three. English country flowers are now in season meaning peonies, stocks, and delphiniums can be included in country-style bouquets at The Flower Shop. 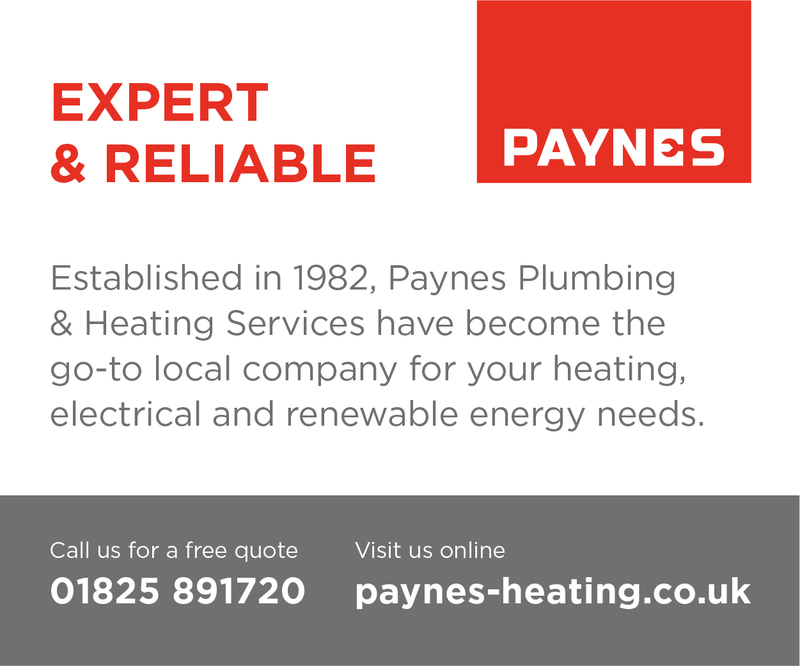 Call in to see the variety available. New window display at The Flower Shop. Father’s Day gift ideas at Kamsons include Clarins Men, a range including face wash, shampoo and shower, smooth shave, shave ease oil, and anti-fatigue eye serum. There’s a wide selection of after shaves to choose from too. New at Kamsons are Clarins water lip stains which protect the lips from ‘environmental aggressors’. Four different colours can be worn on their own or under lipstick. They are £19 each. 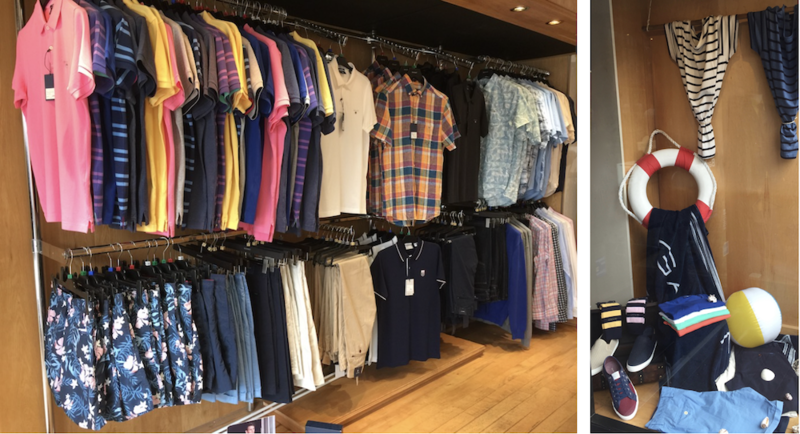 More short-sleeved shirts have arrived at Cole’s and there is plenty of summer stock in store including beachwear of shorts, T-shirts and pumps. Don’t forget hire wear is available at Cole’s too – ideal for weddings, Ascot, or proms. A selection of summer clothing on display at Cole’s and beachwear in the window. If you are looking for garden furniture more has been delivered at SG Home Interiors. A massive range of teak furniture can now be seen there including benches, tables and chairs. There are lots of garden lanterns too. In addition you can order kitchens, bathrooms and bedrooms at SG Home Interiors. 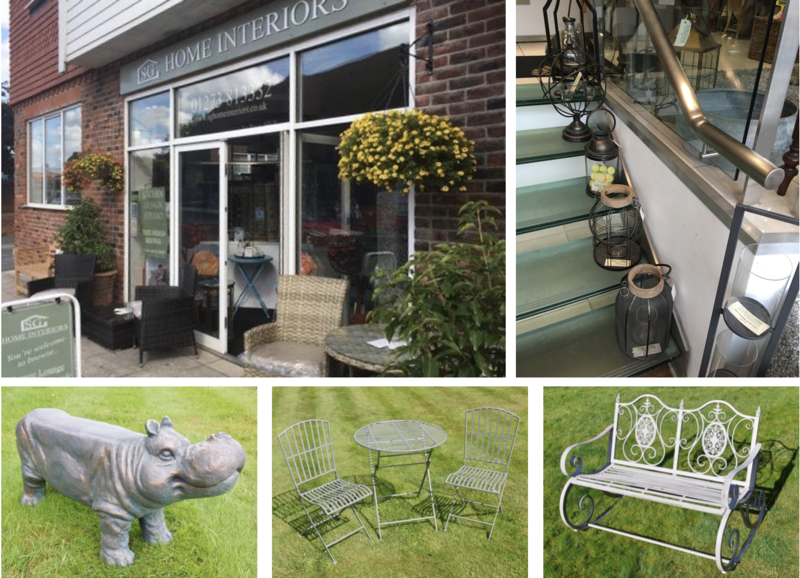 Lanterns and garden furniture at SG Home Interiors. There is still time to make your own Father’s Day gift at Kilnwood Studio in Uckfield. Choose a mug, picture frame, motorbike, or car to paint then have it glazed and fired ready to present to your Dad. 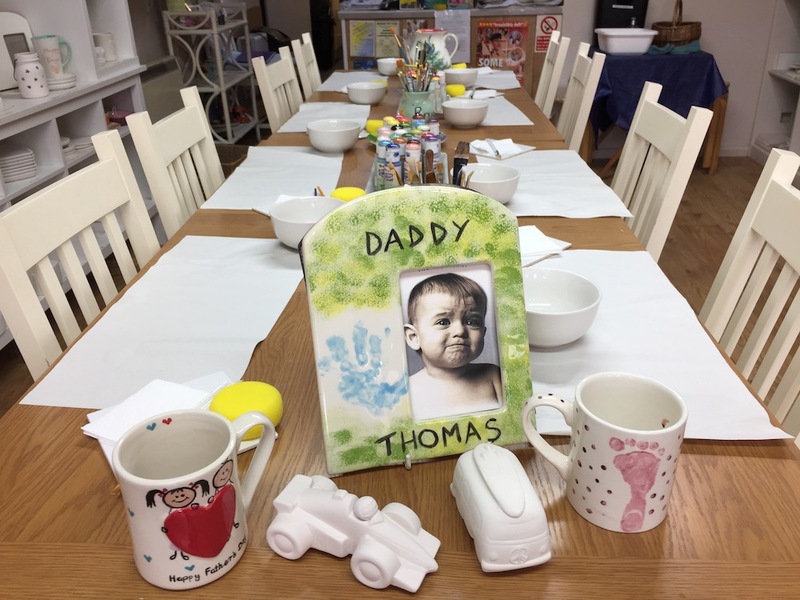 Paint your own pottery gift for Father’s Day at Kilnwood Studio in Uckfield. There are strawberries and cherries in new paintings by Lana Okiro at the Diane Hutt Gallery. Cherries and strawberries in paintings by Lana Okiro at the Diane Hutt Gallery. More new paintings can be seen in the gallery window including the two below by Leanne Christie, Faberge Shimmer, and Summer on the Breeze. 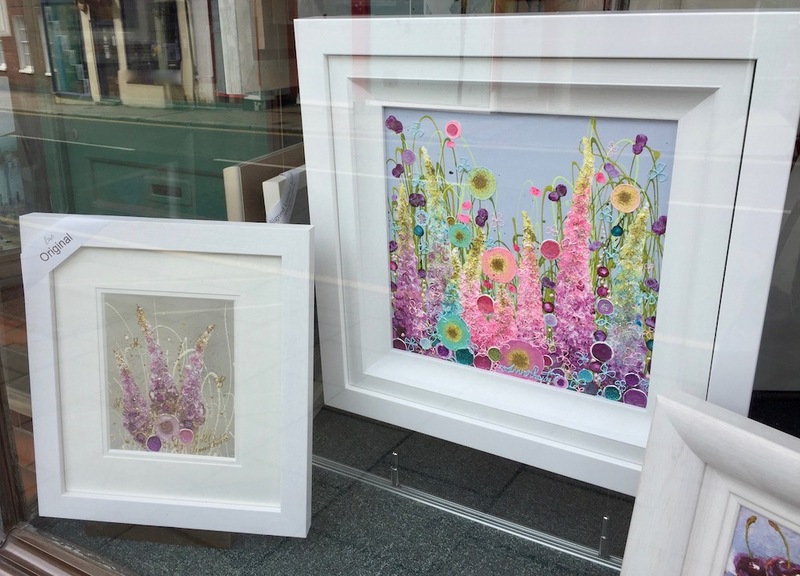 Faberge Shimmer and Summer on the Breeze, two paintings by Leanne Christie in the window at the Diane Hutt Gallery. 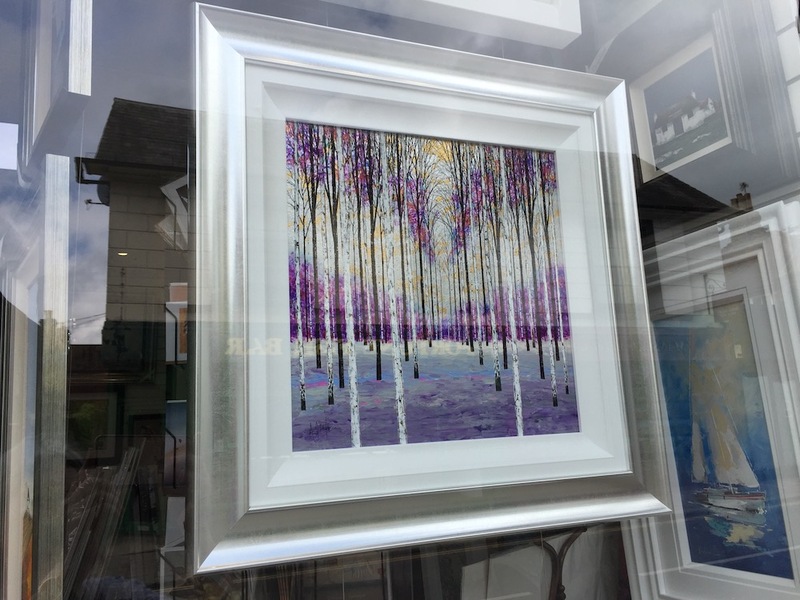 Also in the gallery window is Birch Original by Alex Jawdokimov. See below. Birch Original by Alex Jawdokimov in the window of the Diane Hutt Gallery. 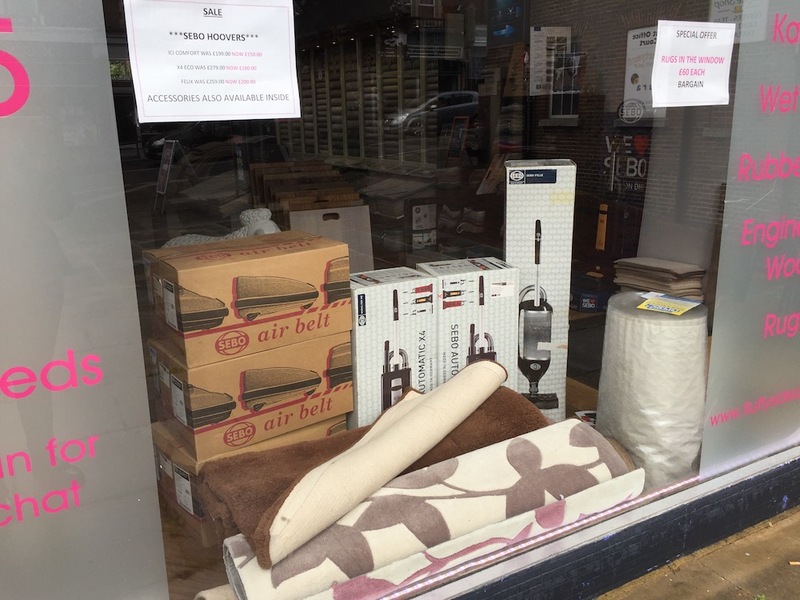 Vacuum cleaners and rugs are in a clearance sale at Fluffy Side Up. You will spot them in the shop window. Bargains in the window at Fluffy Side Up. New displays have been added and there will be space for more once the sale is over. Shop owner Sebastian Bishop said he is pleased to have his business in the heart of town. 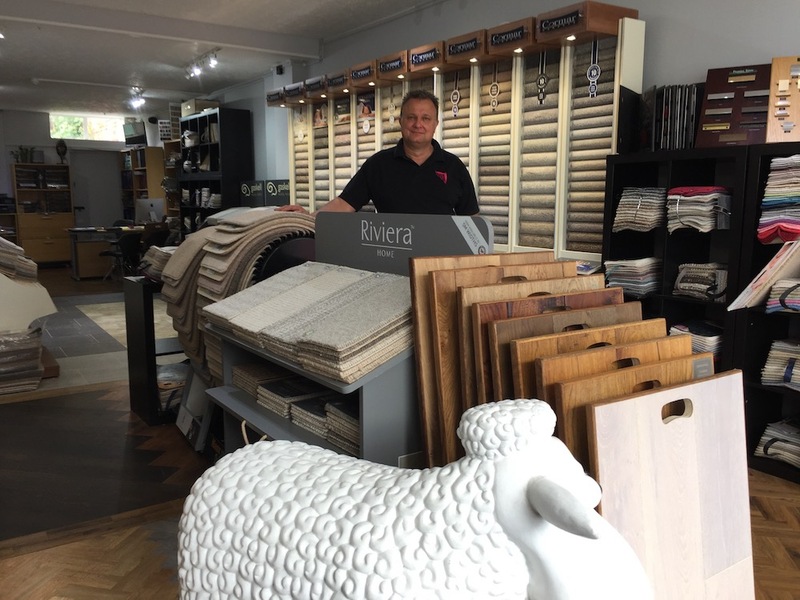 Stock has been carefully selected to give people a choice of flooring ranging in price from £9.95 a square metre to £150 a square metre. Sebastian Bishop inside Fluffy Side Up. Tennis rackets and accessories are available at Final Score as the season gets under way. There are rackets from brands including Head, Wilson and Karakal, footwear from K-Swiss, Asics, and Adidas, and clothing from brands including Nike, Yonex, and Puma. Accessories available include tennis balls, grips, shock traps and sweatbands. Don’t forget Final Score offers a fast, efficient, in-house re-stringing service. Variety in tennis rackets available at Final Score.